Death by chocolate cupcakes. 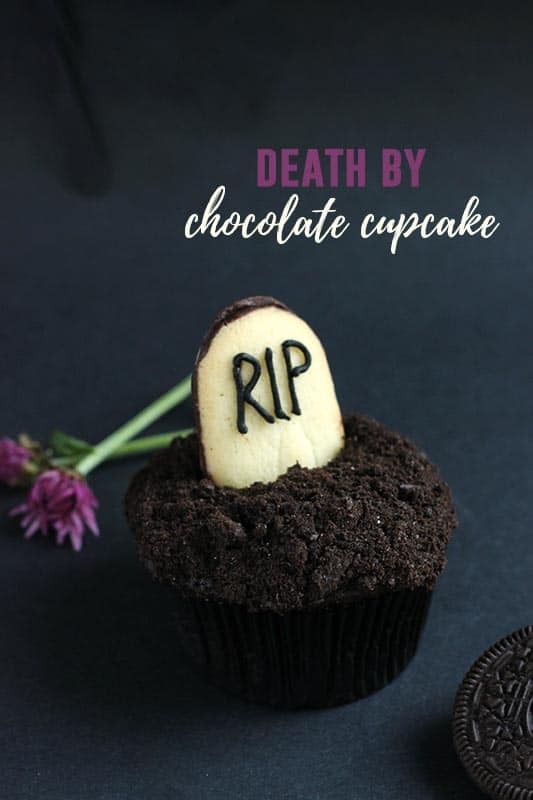 Rich chocolate cupcakes are topped with a dark chocolate frosting, dipped in crushed Oreo cookies, and garnished with a Milano cookie designed to look like a tombstone. Perfect for a quick Halloween treat! Be prepared to have all of your chocolate dreams come true. These cupcakes are packed with flavor and the simple design is perfect for even a novice baker (trust me, I’m terrible at cake decorating!). All of the design magic happens with a pack of Milano cookies and a tube of black frosting. 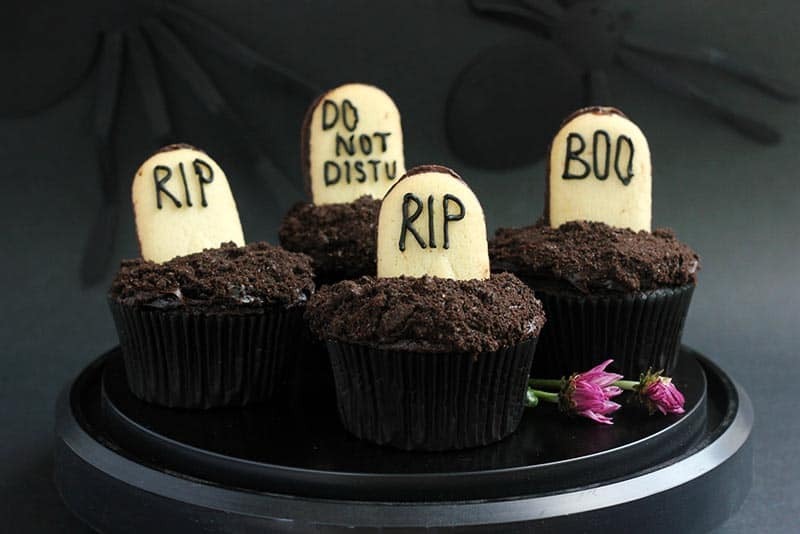 Following the flavor theme we decided to give these cupcakes a tombstone topper with a few quick and fun sayings. I picked the best side of each cookie and piped out a few of our favorite spooky Halloween sayings. Dip your frosted cupcakes in crushed Oreo cookies for a fresh dug grave look and stick your cookie right into the top! Spooky treats ready to be devoured. Preheat your oven to 350 degrees. Line one muffin tin with paper liners. Set aside. Whisk together your flour, salt, baking soda, and cocoa until it’s smooth and no lumps remain. Set aside. 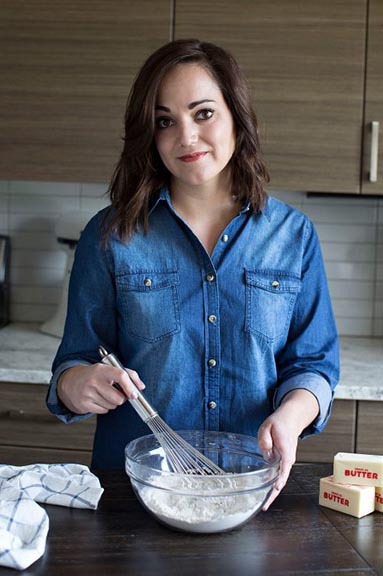 In the bowl of an electric mixer, cream together the butter and sugar. Stir in the melted chocolate, eggs, oil, vanilla, and sour cream. Once that is fully combined add in your dry ingredients followed by the coffee. Fill your liners 2/3 full and bake for 16 minutes, or until a toothpick comes out clean. Cool completely. Crush the Oreo cookies. Dip the tops of your frosted cupcakes in the crumble. 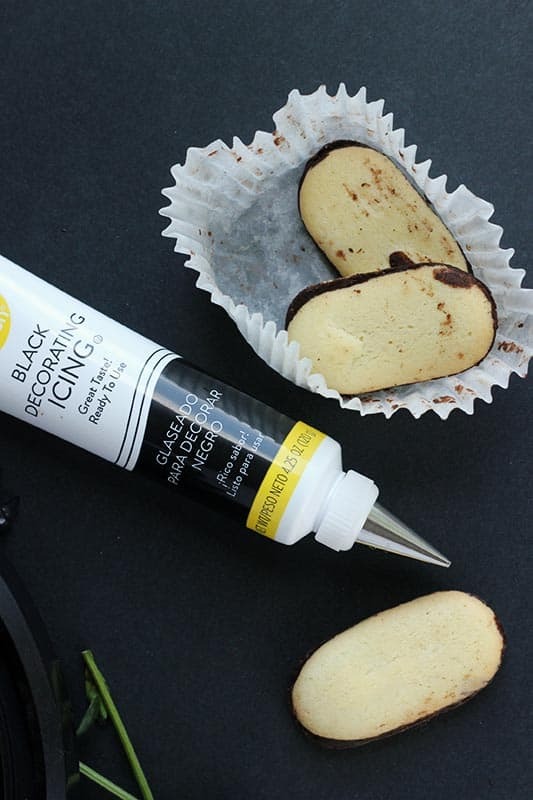 Use the black frosting to write on the tops of each Milano cookie. Stick into the top of your cupcake. Death by chocolate is by far the best way to go. These are awfully cute! You can never have too much chocolate! Pinned! These are completely adorable! Yum! How on earth did you make these SO adorable?!?! I love these. I can’t wait to try them out for our Halloween party. How can you go wrong with a name like “death by chocolate”?? PINNING! I love all of your Halloween treats!! This looks so cute and yummy! Love it! They look so yummy! I did something similar a few years ago and it was a big hit.